This is the story of General George S. Patton's magnificent Third Army as it advanced across Nazi-occupied Europe and into Hitler's redoubt in the last year of World War II. As America’s own answer to Blitzkrieg, Third Army’s actions from the Normandy coast across France and Germany to Austria gave a new dimension to the term "fluid warfare." They only needed one general order—to seek out the enemy, trap, and destroy them. This they did, relentlessly overcoming every obstacle thrown in their way. Third Army’s story is one of the teamwork, of armor, infantry, and aircraft working together with a perfection that even amazed the Germans, who had always considered themselves the masters of the mobile offensive. Though Third Army is often remembered for its tank spearheads, like the 4th Armored Division, these pages also give credit to the brave infantry divisions which butted their heads against fortresses such as Metz with ultimate success. It is also the story of a triumph of administration as thousands of trucks carried forward the supplies so vital to keep the army on the move and fighting. When a German counteroffensive nearly burst through the U.S. lines in the Ardennes, it was Patton’s Third Army that turned on its heel and immediately drove in the “Bulge,” ending Hitler’s last great hope for success in the west. Afterward nothing could stop Third Army itself as it crossed the Rhine and overran the Reich. 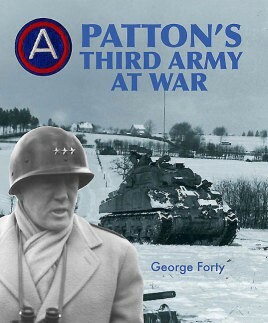 Much of Third Army’s greatness, its driving force, its will to win, was owed to one man—General George Smith Patton, Jr - and in consequence a significant section of this book has been devoted to him alone. In these pages renowned military historian George Forty gives a vivid impression in words and pictures of what it was like to live and fight with Patton’s men. Full of eyewitness accounts and a host of photographs and maps, it relates the full story of how America’s most dynamic fighting formation led the Allied effort against the Nazis’ seemingly invincible European empire.